Verdict: As soapy as it sounds. Objectively speaking, this show is bad. It is incredibly soap opera-ish [and not in the satirical fun way]. I mean… the first episode already had a car crash, real estate intrigue, a father/son falling out, an oil rig heist, a pregnancy and possibly a fire. Plus lines like “You don’t deserve to be my son” and “You think I’m just gonna hand you the keys to the kingdom?” Now… that’s soapy. The dialogue wasn’t much better [but the actors were pulling it off somehow]. So yeah... this is hardly Mad Men [nor should it be]. YET - for whatever reason - I found it really interesting. Perhaps it is because I watched it right after The Player [which is the worst new show I’ve watched so far], perhaps it is because I seriously loved Greek, or perhaps it is because I never watched Dallas and there is a void in my TV experience. I really don’t know. But much to my surprise, I really enjoyed Blood & Oil [more than Quantico, in fact]. 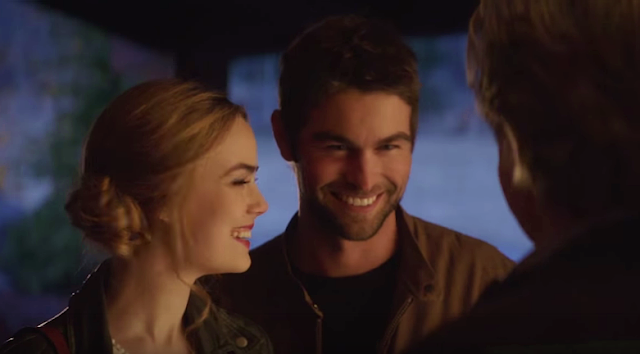 The show feels like a teen soap [with adults] that would fit the CW’s line-up 10 years ago. In that context, the show is toplined by two teen show alums from Gossip Girl and Greek: Chace Crawford (the good guy) and Scott Michael Foster (the rebellious guy); and for the older crowd, we have Don Johnson. A powerful magnate, two opposite young men, a couple of pretty girls, a LOT of daddy issues, land disputes, Native American spirit animals… put it all together and you have my next guilty pleasure. Who knew? Should you watch it? I am gonna say yes. Believe me, I am shocked by my own recommendation. But I am actually really curious to see the next episode! [Looking forward to it even] Is there going to be a fire? Like seriously, I need to know. Do give this show a go if you enjoy watching Nashville, Gossip Girl, The OC, Revenge and the like. Oh Oh I love "Greek" too!! Kappie! I am mostly watching this for Chace C. to be honest.